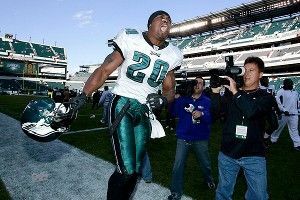 Along with Allen Iverson, Brian Dawkins is my favorite Philadelphia athlete ever. They both arrived in Philly in 1996, right when I left. And they both played with complete disregard for their own personal well-being, willing to do absolutely anything to win a game. There was nothing outside of the sport they were playing, nothing else mattered. And, as anyone from Philadelphia can tell you, that quality is valued most over almost any other. I would watch Sixers and Eagles games whenever I could. And whenever Iverson would go rampaging through the lane or Dawkins would separate a wide receiver’s soul from his body, I would just think to myself, Yup. That’s my hometown. But where everything about Iverson’s game seemed very much rooted in the real world — representing an entire culture and a whole generation with every cross-over dribble — Dawkins, who announced his retirement from the NFL on Monday, seemed to be from another world. Which is exactly the way he wanted to be perceived. I don’t remember when I first saw the below NFL Films piece on Dawkins. I know now that part of the “transformation” Dawkins made himself go through — to go from mild-mannered, deeply religious Brian Dawkins to speaking-in-tongues, berserker “Weapon X” — was probably necessary for him to play the game the way he did. He was basically a human ICBM. God knows how many head injuries he doled out or accrued himself. who hasn’t dreamed of being Wolverine?